...is unlike any other form of aviation. Quiet, simple, peaceful, basic, elegant, and historic. The first manned flight was in a hot air balloon back in 1783. My sincere thanks to the staff of Balloon Excelsior, who assisted me through my balloon pilot training. I highly recommend them. They are a Part 141 ballooning school (only two or three exist). 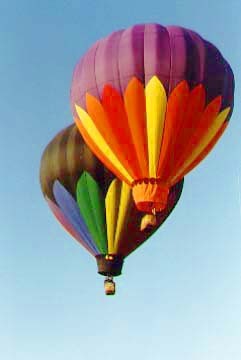 The Balloon Federation of America is the national organizing body. Kodak Albuquerque International Balloon Fiesta is the world's biggest balloon meet.